"These simple cut out cookies are a must during Christmas time in Germany. Especially kids delight in helping cutting out fun shapes and later decorating and eating these delicious cookies that hold their shape." Combine butter, white sugar, vanilla sugar, and egg in a bowl and beat with an electric mixer until light and fluffy. Mix flour and baking powder; add to butter mixture with electric mixer on lowest setting until dough becomes crumbly. Work dough crumbles with your hands into a smooth dough and place into a sealable container. Refrigerate until chilled, about 1 to 2 hours. Roll the dough out to 1/4 inch thick on lightly floured surface and cut into desired shapes using cookie cutters. Place cookies 1 inch apart onto the prepared baking sheets. Pick up all the left over dough, press together into a ball, and repeat the rolling and cutting out process until all the dough is used up. Bake in the preheated oven until edges are lightly browned, about 8 to 10 minutes. Allow cookies to cool on baking sheet for 5 minutes before carefully removing to a wire rack with a knife or thin spatula to cool completely. To make glaze, mix together powdered sugar and lemon juice until it has a smooth and spreadable consistency. Add more lemon juice if you like a thinner glaze. Add food coloring if you like. 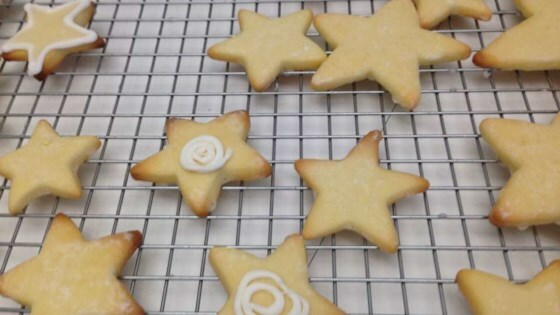 Brush frosting on cooled cookies and add chocolate sprinkles or sugar sprinkles as you like.